Despite the rotary engine's delay and swirling rumors about its future, Mazda says dropping the program isn't an option. TOKYO -- Development of the next-generation rotary engine from Mazda Motor Corp., first unveiled three years ago, is making slow progress despite missing emissions targets. A top Mazda powertrain executive said today that the 1.6-liter rotary engine, called the 16X, is about 30 percent more fuel-efficient than the current rotary engine used in the RX-8 sporty car. In fact, the 16X so far performs slightly better than Mazda's standard two-liter gasoline engine, said Mitsuo Hitomi, general manager of the Japanese carmaker's powertrain division. But the engine is at least one model year behind schedule because of problems hitting emissions reduction targets. And Hitomi concedes it's still not ready for production. “Maybe within two years we can tell you when we will introduce it to the market,” he said. When unveiled at the 2007 Tokyo Motor Show, the 16X featured an enlarged elliptical shape for the combustion chamber and an enlarged eccentric center stroke in the rotor. 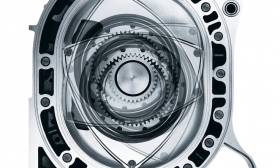 Mazda also planned direct-injection fuel delivery in a rotary engine for the first time. But the project moved to the back burner during the global financial crisis as Mazda diverted more resources to developing the new line of fuel-efficient SkyActiv engines, which debut next year.